To use the Pricemesh price comparison plugin for WordPress only a few steps are necessary. The installation can be done with the WordPress installer. More information about this at Installation via Wordpress at the end of the page. You don't need to change the structure of your WordPress installation, or a new theme and don't have special requirements on your server. Install, enter token and secret key, done. The commission is paid by the connected networks (eBay Commerce Network, Amazon & Co). Here, it will be decided which shops are displayed in the price comparison: Only if there is an active partnership with the shop it will appear. This gives you complete control of the shops you want to promote at any given time, and the provisions you earn with them. Barcodes can be added manually via the barcode box. Here you can also enter links on the product pages of amazon. The ASIN will be extracted automatically. on the product box automatically adds all barcodes to the current post. Pricemesh can basically be displayed on all pages of the Type Post. The only requirement is that at least one barcode was filed to the post. With a short code the price comparison can be placed at any desired location within the post. Simply place the short code in your contribution at the appropriate location [pricemesh]. It is then automatically replaced with the price comparison. In the standard setting the price comparison will be displayed in the area between text and commentaries. No further configurations have to be made here; the price comparison will integrate automatically. With a widget Pricemesh can basically be displayed at any location on your website i.e. on the sidebar, as a tab or in the footer. Please keep in mind though, that the location is provided by your theme and can therefore vary. To activate the widget, proceed as follows: Click on the left side of the admin area on appearance and then on widgets. Pull the Pricemesh widget from the left side to the area in which it is to be displayed (i.e. sidebar). The configuration menu is located in the admin area. Click on Settings and then in the sub menu on Pricemesh. Authenticates your account on the Pricemesh servers and must be entered.Clicks and views on your site are tracked with it. The Demo Token is fully functionally, but you can't earn any commission with it. Serves for the authentication. Different than the token, which is openly visibly in the source code of your website, the secret key shall remain confidential. It is used to allow additional functionalities i.e. search functions. If WPRobot is installed with the amazon extension, the plugin can access the ASINs added by WPRobot and display a price comparison on the post. 1. Login to the WordPress admin area on your website. 6. Click in the admin menu on the left side on settings on the entry Pricemesh and enter your own token and secret key. 5. Add ASIN, UPC, EAN or ISBN of the product to a post. 1. Download pricemesh.zip in /wp-content/plugins/ and unpack the file there. 2. Log in your Wordpress admin area. 3. Activate the Plugin in the Plugin menu. 4. Click in the admin menu on the left side on settings on the entry Pricemesh and enter your own token and secret key. Links Also, it is now possible to optionally place a link on the shop logo and also on the price. Custom Post Types Custom Post Types are now supported. Theme A Dark Theme is now available. Title The title for the price comparison can be specified now. Bugfixes Debug information was not set correctly. Bugfixes Some small bug fixes. Title Product titles can be displayed now. Bugfix Fixes displays errors in the admin area. Pages It is now possible to use pricemesh on sites with type 'page'. 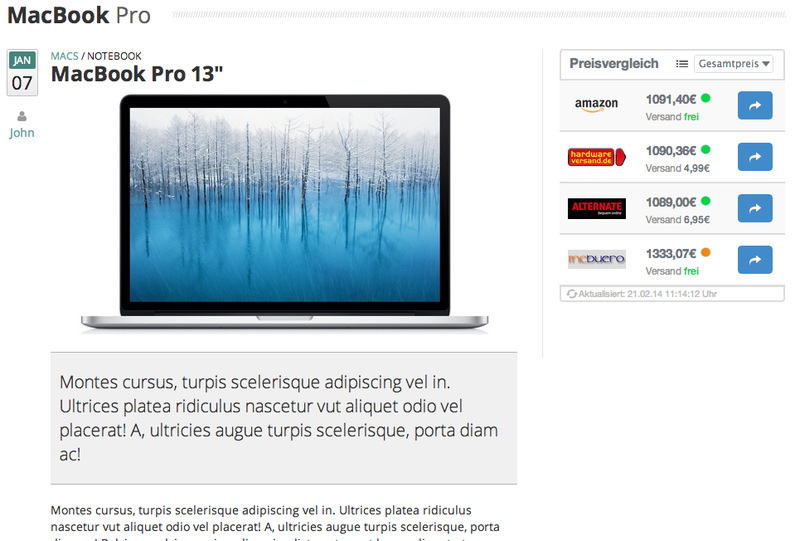 WooCommerce New WooCommerce Integration: Pricemesh can now be displayed on the product pages. There are numerous options to adapt the design and the beheaviour of the Plugin. Stylesheets Now you can integrate your own style sheets. Disclaimer A disclaimer can be optionally displayed. Products The number of displayed results can be adjusted now. Shipping Shipping information can now be hidden. Hide The price comparison can only be hidden if no product was found. Bugfix For users with older PHP versions. search function There is no need to search for barcodes on different websites. 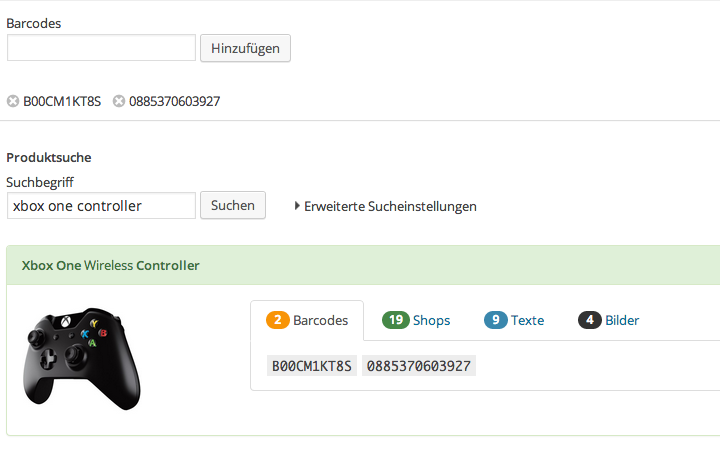 The product search can search through the shops who have an active partnership with you. Zanox Pricemesh offers now full Zanox support. Settings The configuration menu disappeared from the main page and is now in the Wordpress submenu. WPRobot WPRobot users with the amazon extensions from WPRobot can now extract barcodes automatically. Bugfix As soon as an error is detected and solved it is marked red. New Features All new Plugin features will be marked green. Change Major changes of the Plugin structure will be marked yellow.